Gabrielle Spear is a poet and community organizer based in Queens and raised in Northwest Arkansas. 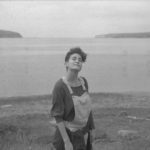 She was named a Goucher College Kratz Summer Writing Fellow, a finalist in LUMINA' s 2017 Borders and Boundaries Nonfiction Contest judged by Leslie Jamison, and a Brooklyn Poets Fellow. Her work has appeared or is forthcoming in The Matador Review, The Indianapolis Review, Sonora Review, and fields magazine among others. You can find her ranting about cover letters, the MTA, and Zionist hummus @gabsters93.